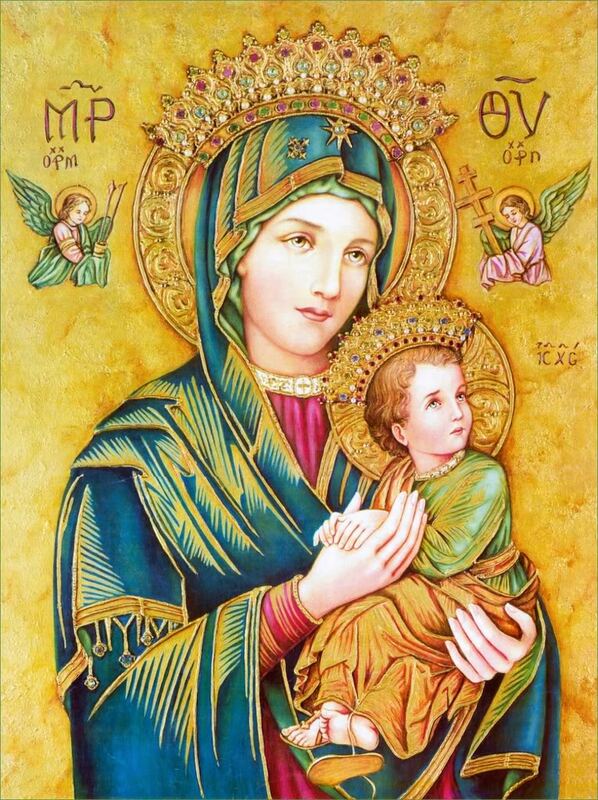 Catholic News World : #Novena to Our Lady of Perpetual Help - SHARE #Miracle Prayer! #Novena to Our Lady of Perpetual Help - SHARE #Miracle Prayer! Come, Holy Ghost, Creator blest, And in our Souls take up Thy rest, Come with Thy grace and heavenly aid To fill the hearts which Thou hast made. We fly to thy patronage, O Holy Mother of God. Despise not our petitions in our necessities. But ever deliver us from all dangers O glorious and blessed Virgin. Priest : O Mother of Perpetual Succour, thou whose very name inspires confidence. People : Help me, O loving Mother. Pr. : That I may love and serve God with all my heart. Pe. : Help me, O loving Mother. Pr. : That I may quickly rise again should I have the misfortune to fall into sin. Pr. : That I may courageously resist the seductions of the world, evil companions, bad books and films Pe. : Help me, O loving Mother. Pr. : That I may often and devoutly receive the Sacraments and fulfil my Christian duties and the duties of my state. Pr. : That I may ever love and serve thee and invoke thy assistance Pe. : Help me, O loving Mother. Pr. : When death is near and I am about to pass into eternity. Pr. : To my last hour, to my last breath do thou watch over me. Alas, too often in past times have I miserably fallen * Because I had not recourse to thee * I know that with thy help I shall conquer * I know that thou will help me * If I recommend myself to thee * But I fear lest in the occasion of failing * I should cease to call upon thee * And so should lose my soul * This then is the grace I seek from thee, * and I beg of thee, as far as I know how and can, * to obtain it for me * namely, in the assaults of hell,* always to have recourse to thee and to say to thee; * O mary help me * Mother of Perpetual Succour, * Suffer me not to lose my God * Amen. People : Pray for thy Children. Holy Mary, * Succour the miserable, help the faint hearted * Cheer those that weep, *Pray for the people ,* be the advocate of the clergy, * Intercede for all devout women, * Let all feel thine aid,* Who implore thy perpetual succour. Priest : Thou has been made for us O Lady, a Refuge. People : A helper in need and tribulation. O Lord Jesus Christ,* Who hast given us Thy Mother Mary, * Whose wondrous image we venerate, * To our Mother ,* Ever ready to succour us,* grant , we beseech Thee,* That we, who earnestly implore her maternal aid, * May deserve to enjoy perpetually the fruit of thy redemption * Who lives and reigns world without end. Amen.